Note to readers: Only the charts and the Market Summary change from week to week. All other text remains the same, in order to allow regular readers to quickly absorb the entire Brief. Each Thursday evening, we take some time to reconcile some of the varied options indicators available for the S&P 500. These indicators are unique to zentrader, and were developed in order to give readers an edge in the stock market. These indicators were meant to be tangible – easily understood at a glance – thus providing an instant snapshot of the stock market to anyone regardless of trading experience, or the lack of experience. First, we take the stock market’s Temperature. We need to know if the stock market is hot right now, or if it has cooled off. In other words, is this a hot Bull market in which stock prices are going up, or a cold Bear market in which stock prices are tumbling? To take the Temperature of the S&P 500, we look at the performance of a simple option trade known as a Covered Call. Covered Call trading is almost always profitable in a Bull market, and very often results in losses in a Bear market. Conversely, if Covered Calls* are profitable it is currently a Bull market, and if Covered Calls are returning losses it is a Bear market. We consider the point at which Covered Call trading breaks even – returns zero profit and zero loss – to be an S&P 500 Temperature of zero. Then we determine whether the S&P 500 is above or below that all-important break-even point. 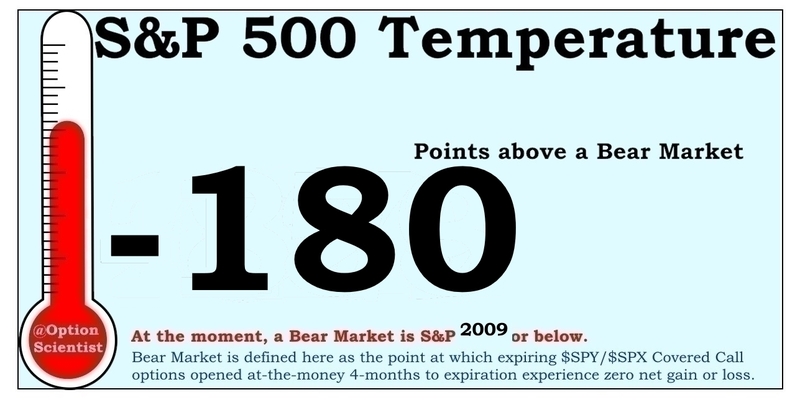 By measuring the distance of the current level of the S&P 500 from the break-even point we determine the Temperature. Above zero indicates a Bull market; below zero indicates a Bear market is in progress. The historical 10-year chart of the S&P 500 Temperature (above) shows its importance as an indicator. Not only are Bear markets highly-correlated with sub-zero Temperatures, the sub-zero readings often occur before stock prices have broadly declined 20%. Furthermore, the Temperature rarely falls below zero during a Bull market, so no matter how severe a pullback occurs in a Bull market, the uptrend almost always continues as long as the Temperature doesn’t dip much below the zero mark. Next, we use the S&P 500 Temperature to determine the type of trading environment that is most likely to be prevalent in the stock market. Perhaps not surprisingly, hotter temperatures tend to coincide with a more positive outlook, thus more exuberance for those buying stocks. Lower Temperatures tend to correlate with fear and a propensity to sell stocks. It should be noted that the Temperature ranges above represent a continuum. That is to say, they are not written in stone. For example, a Temperature of 1 degree below zero does not somehow magically represent a shift to a Bear market. Nevertheless, the ranges have been historically accurate in a wide variety of market environments for well over a decade. All stock-market indicators are prone to fail at times, and the Temperature is no different. Though rare, below zero readings have occurred outside of Bear markets. Most recently, the S&P 500 Temperature dipped below zero in October 2014 without an accompanying Bear market ensuing, one of only a few such occurrences in past decades. Once we have associated the current Temperature with the current Stage of the market, it is possible to plot that Stage on a graph. Traders often use an Elliott Wave analysis to help determine the reason for current trends in the stock market. Because traders act as a herd, and because herds tend to react in a somewhat predictable pattern, stock prices tend to follow a pattern as well. That pattern can sometimes be reasonably outlined using the Elliott Wave theory. 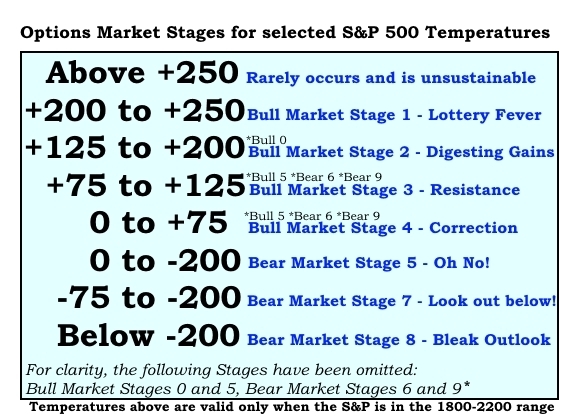 Here we use the current S&P 500 Temperature to determine the current Stage of the stock market. Then we mark the most appropriate spot on a typical Elliott Wave which correlates to previously-calculated Stage. Since most S&P 500 Temperatures can only be achieved during one specific Options Market Stage, choosing the current location on the Elliott Wave is simply a matter of matching the current Stage to the Wave. Some Temperatures, though, can occur in a number of different Options Market Stages, and require some additional insight. 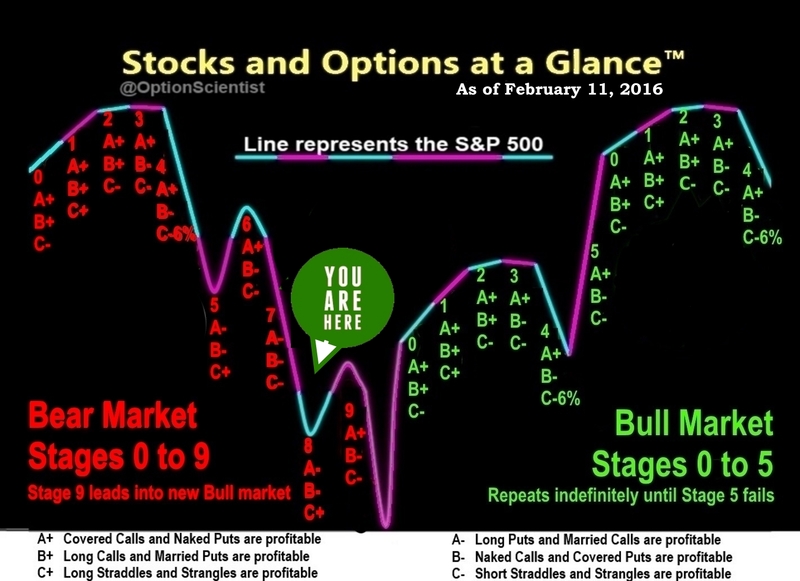 For example, Bull Market Stage 2 and Bull Market Stage 0 each occur at a Temperature between +125 and +200. As can be seen on the Elliott Wave above, Bull Market Stage 0 only occurs after a major decline in stock prices has bottomed out, while Bull Market Stage 2 occurs when stock prices are consistently rising. 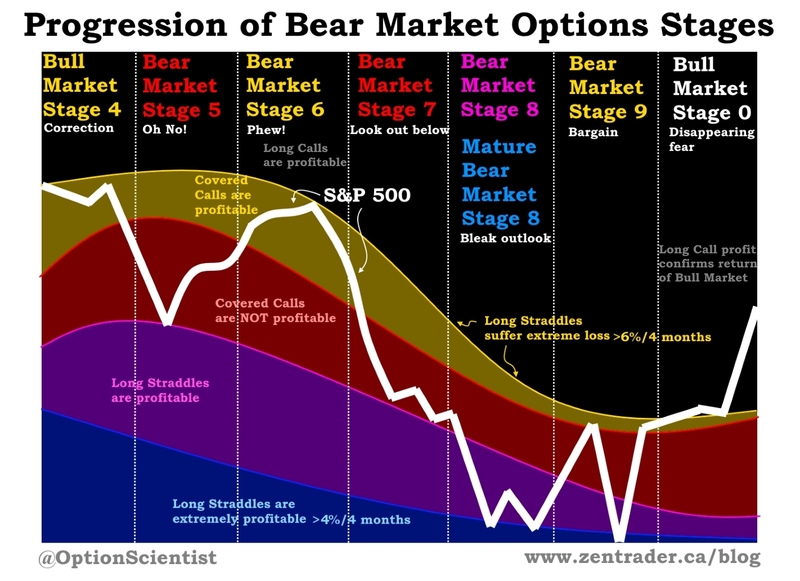 Thus, we can usually differentiate Stage 0 from Stage 2 by knowing how the market has been behaving in recent weeks. Bull Market Stage 3 occurs only when stock prices have recently risen but have hit a brick wall of resistance and are having trouble rising further. Bull Market Stage 5 occurs only after stock prices have tested a major support (such as the 200-day simple moving average) without sinking into a Bear market. Bear Market Stage 6 occurs only after stock prices have fallen well below a major support (200-day simple moving average) and then recovered quickly in a matter of days or weeks. 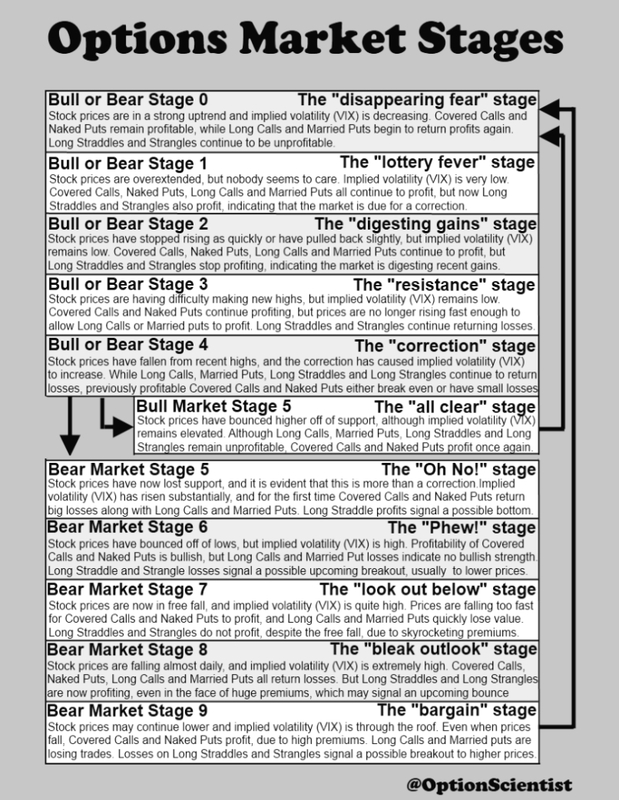 Bear Market Stage 9 occurs only after a protracted period of declining stock prices lasting many weeks or months. Taking into account those extra bits of information, it then becomes possible to determine the current Options Market Stage rather accurately. Plotting it on the Elliott Wave chart then becomes just as accurate. We can then use the Options Market Stage calculated above to determine the current trading environment in the stock market. Since the market is now rather bearish, using the Elliott Wave as a guide, we may find it helpful to plot the expected movement of the S&P 500 based on past Bear markets. As can be seen on the Elliott Wave graph, the “You Are Here” sign points to a specific combination of profit and loss on some simple option strategies. If the S&P 500 Temperature has allowed us to choose our current location on the Elliott Wave graph correctly, we should be able to verify it by looking at the performance of those three strategies. The following chart shows the current performance of each of those three strategies using at-the-money options opened 4-months ago on $SPY (NYSEARCA:SPY) which expire this week. A 10 Year History of the above chart is now available. To further illustrate the current stock market trading environment, we can break down the chart of the Options Market Stages to show the individual performance of each of the three options strategies. 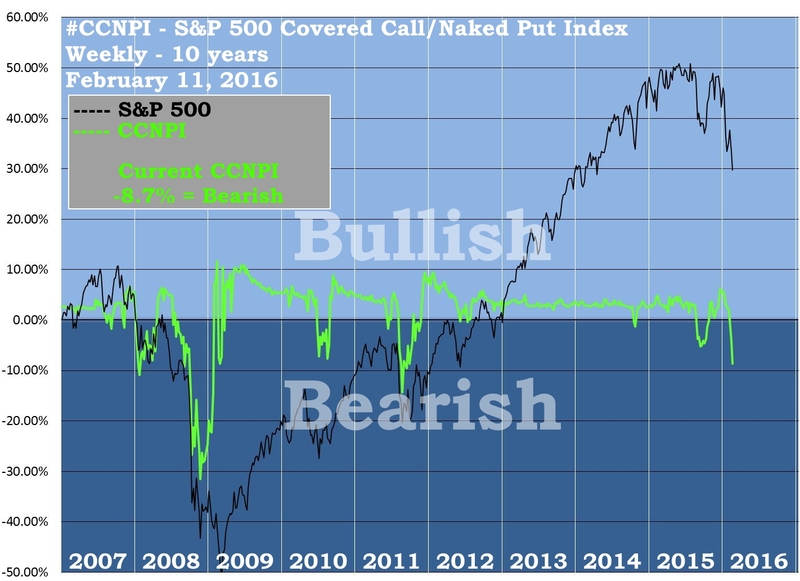 The performance of Covered Calls and Naked Puts shows us whether the current stock market is most likely to predominantly have either a bullish or a bearish sentiment. 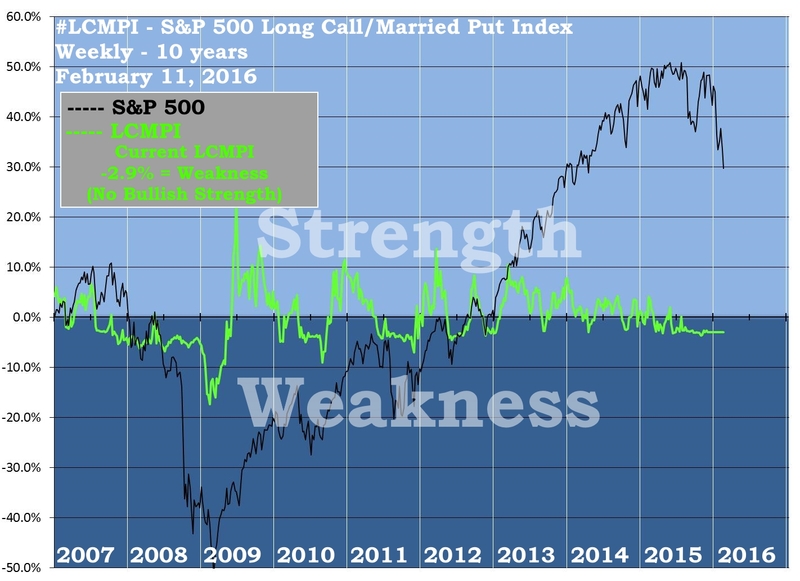 The performance of Long Calls and Married Puts tells us exactly how strong or weak any bullish sentiment is likely to be. The performance of Long Straddles and Long Strangles indicates whether the current trend is surprisingly over-extended (and therefore needs to reverse) or whether the current market has become excessively range-bound (and needs to break out of the range) or whether it is normal (neither in urgent need of a reversal nor in need of a breakout). The S&P 500 Temperature is now nearing the -200 level. That level has only been achieved a handful of times in the past ten years. Notable in recent times, the -200 level occurred immediately prior to the worst part of the 2008 Financial Crisis and just prior to the mini-Bear-market of 2011. Such extreme Temperatures tend to occur only during Bear Market Stage 8. It takes quite a large sell-off for the S&P to sink 200 points below zero. That is 200 points below the level at which expiring Covered Call* options would turn a profit. To put it another way, the S&P could climb nearly 200 points from its current level and Covered Call traders would still end up with a loss. That is nothing to take lightly, especially considering that Covered Call traders get to set the premium on the options they sell. When volatility increases, Covered Call sellers demand higher premiums – which makes perfect sense, the higher premiums give them an added buffer against declining stock prices. The fact that the S&P 500 is now 200 points below the level those Covered Call sellers thought was safe a few months ago speaks to the extreme nature of the recent sell-off. Remember – those Covered Call sellers had recently endured the August 24 massacre that saw the S&P fall nearly 100 points in a single trading session. Even so, the higher premiums they demanded were not high enough to get them through the past few months of sell-offs in the S&P. So, here the S&P sits, nearly 200 points below the level that would make Covered Call traders happy (Covered Calls are not profitable when the S&P is in the red zone or below, on the chart of the Options Market Stages). On its own that is an awfully bearish set of circumstances. But it is even more bearish when one considers the plight of Long Straddle* traders. Those traders are now making a profit. Not only are they making a profit, but that profit has now exceeded any semblance of normality. Profit on expiring Long Straddle trades has now exceeded 4% (when measured as a percentage of the S&P index itself). The 4% threshold is rarely crossed, and the fact that it was crossed this past week speaks to the abnormality of the current sell-off. The sell-off has gone far beyond what most traders would have expected a few months ago. 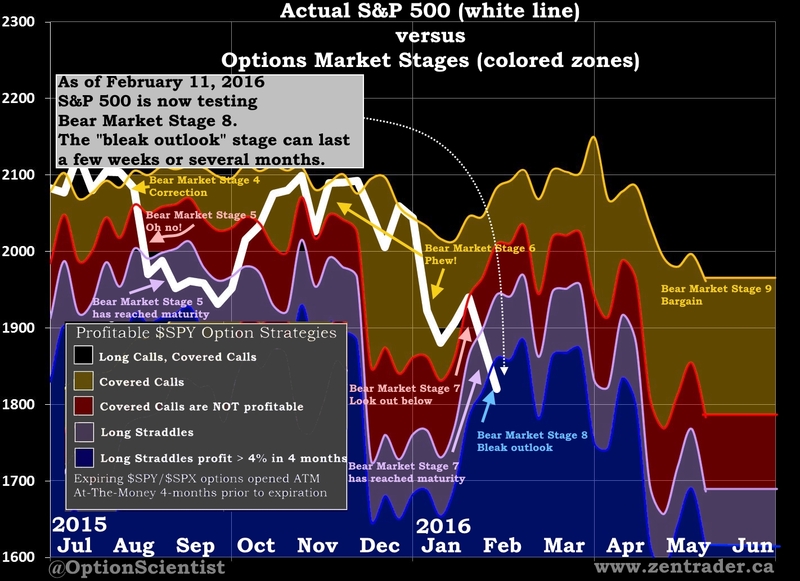 (Long Straddle profits exceed 4% only when the S&P 500 is in the dark blue zone on the chart of the Options Market Stages). 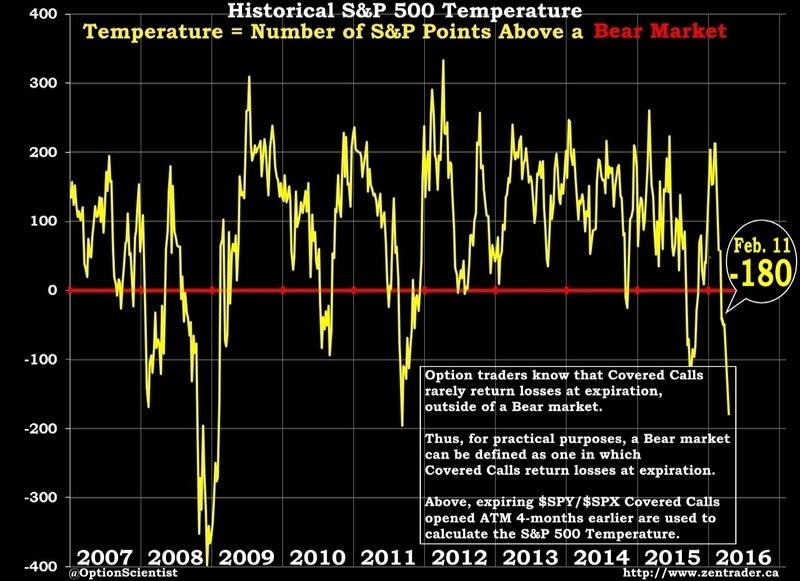 The extreme S&P 500 Temperature indicates the extreme level of bearishness among traders these days. 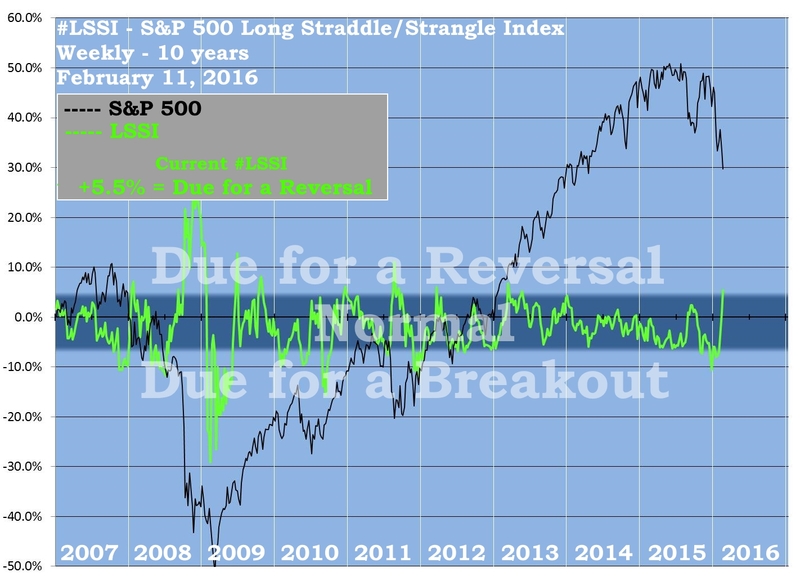 The extreme profitability of Long Straddles indicates the S&P has fallen abnormally fast, beyond what most traders had expected. Together, these events suggest the stock market has entered or will soon enter Bear Market Stage 8. Stage 8 is known as the “bleak outlook” stage because traders tend to lose confidence across the board. All traders, from active day traders, swing traders and position traders to the most passive of retirement savers are now starting to believe the stock market is not a great place to be right now. The outlook is simply too bleak at the moment. The thing about such a bleak outlook is that once it’s entrenched it is difficult to scour out. Once Bear Market Stage 8 takes hold for a few weeks, traders are reluctant to change their outlook. Great economic news does not erase the bleak outlook; neither does an impressive rally for stock prices. The only thing that can erase the bleak outlook is Bear Market Stage 9 – and Stage 9 occurs only when expiring Covered Call options are profitable once again. Since Covered Calls are profitable when the S&P 500 Temperature is above zero, it can be said that once Stage 8 takes hold the outlook will remain bleak until the Temperature climbs back above zero. In the meantime, temporary rallies during Stage 8 tend to occur whenever the #LSSI – the S&P 500 Long Straddle/Strangle Index – hits extreme highs (above +4%). Since the #LSSI is currently at such an extreme high, an impressive rally-off-the-low for stocks would not come as a surprise. Such a reversal of the downtrend is often just a glimmer of hope in an otherwise bleak environment though. Even so, many traders are likely poised to use such a reversal to their advantage, if only to unload long stock positions or to add to shorts. Where’s the Bloodbath for S&P 500?